Halifax moved out of the National League relegation zone with a stunning victory over high-flying Grimsby. Billy Whitehouse's debut goal, James Bolton's driven effort and Nicky Wroe's cool finish gave the home side a surprise three-goal lead at half-time. Padraig Amond gave the visitors hope late on before Jake Hibbs placed one into the top corner to restore the two-goal cushion. 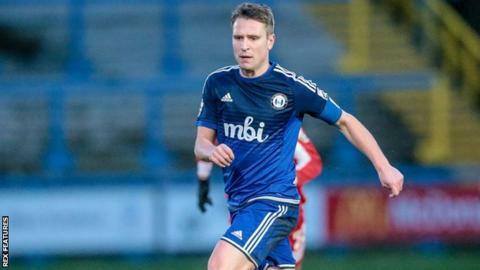 The Mariners' Jon Nolan smashed in a late consolation as Halifax held on. "We were certainly punished. They were very dangerous on the break and I think we had more of the ball, but then give it away in some bad areas. "The first two goals were an inability to defend a set piece and a ball in the box. They were pretty lethal in their attacks. "In the end, what happens in both boxes determines games of football and certainly Halifax were very clinical and we were perhaps a bit toothless. "We did have our opportunities to score and when you're behind in the game you need to take them." Match ends, FC Halifax Town 4, Grimsby Town 2. Second Half ends, FC Halifax Town 4, Grimsby Town 2. Goal! FC Halifax Town 4, Grimsby Town 2. Jon Nolan (Grimsby Town) left footed shot from outside the box to the bottom right corner. Goal! FC Halifax Town 4, Grimsby Town 1. Jake Hibbs (FC Halifax Town) from a free kick with a right footed shot to the top left corner. Goal! FC Halifax Town 3, Grimsby Town 1. Padraig Amond (Grimsby Town) right footed shot from the centre of the box to the centre of the goal. Assisted by Nathan Arnold. Foul by Gregor Robertson (Grimsby Town). Shaquille McDonald (FC Halifax Town) wins a free kick. Attempt missed. Jordan Burrow (FC Halifax Town) right footed shot from outside the box misses to the left. Substitution, Grimsby Town. Anthony Straker replaces Ryan Jennings. Substitution, FC Halifax Town. Jordan Burrow replaces Richard Peniket. Foul by Billy Whitehouse (FC Halifax Town). Attempt missed. Nathan Arnold (Grimsby Town) right footed shot from outside the box misses to the right. Foul by Richard Peniket (FC Halifax Town). Substitution, FC Halifax Town. Jake Hibbs replaces Josh MacDonald. Attempt saved. Gregor Robertson (Grimsby Town) right footed shot from the centre of the box is saved. Assisted by Nathan Arnold.